Second family Members receive 25% off and each additional family member receives 50% off. All of our programs are also accessible by purchasing a non-recurring “punch pass” for one or a series of classes. The Next Level Striking System curriculum is built from the techniques of Muay Thai; a martial art over a thousand years old, and the national sport of Thailand. Muay Thai incorporates the use of stand-up striking and clinching techniques to overcome an opponent in close quarters. Also known as, “the art of eight limbs”, Muay Thai is characterized by the combined use of punches, elbows, knees, and kicks. The practitioner will experience many benefits including discipline, respect, self-confidence and fitness. This program is developed for all fitness levels and progresses in difficulty as the student advances through the curriculum. Muay Thai is an excellent martial art for self defense as it incorporates both striking and clinching techniques to give the practitioner the tools and confidence to defend themselves at range and in close quarters. MMA at Next Level is a contact sport that implements a wide range of fighting techniques including striking, kicking, and grappling. Boxing, Muay Thai, wrestling and Jeet Kune Do are combined to teach you confidence, discipline, self- defense as well as provide an intense workout. Our classes are great for both men and women, and we also offer MMA for kids. Whether you are looking for a motivational method to get in shape or to get competition ready, our instructors have both the training and experience to help you reach your goals. Our women’s only program offers a high energy workout without any physical contact. This program builds a lean and strong physique that will boost your confidence in and out of the gym. We also offer a children’s play area to accommodate a parent’s busy schedule. A two-for-one cardio and strength workout, boxing targets the entire body in addition to boosting strength and cardiorespiratory fitness. Boxing improves a number of skill-related parameters of fitness including balance, coordination, reactivity, and agility. With a potential burn rate of 13 calories a minute, boxing goes head-to-head with other types of cardio like running and cycling. Plan to punch away anywhere from 400-800 calories per hour. The chief characteristic of the style is to evade all types of attacks and to relentlessly counterattack. Mobility is a central theme which all practitioners strive to emulate. To be able to move quickly involves evasive footwork. Contrary to what is commonly said about White Crane Kung-Fu, the practitioners always go on the offense until the fight is finished. White Crane is one of the few styles that is a complete system. Even though it is generally known as a long-range system it also has a variety of short hand techniques, throws, joint locks, and breaks. White Crane also has a soft internal form known as the Cotton Needle. High Intensity Interval Training class that uses functional training techniques to increase strength and endurance. Ready to kick that boring fitness routine to the curb? Lunch fit is a 30 minute functional strength and conditioning circuit designed to turbo charge your fitness while increasing your power and explosiveness. These circuits change daily and alternate between strength and cardio focused days. The class runs from 11:30am until 1:30pm, Monday to Friday. To join in on the fun, simply come in anytime between 11:30am and 1:00pm and jump into the class lead by our high energy trainers who will coach you through the exercises while motivating you to push your limits. 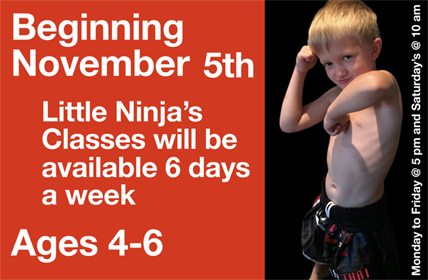 The Little Ninjas Muay Thai program is based on the Next Level Striking System. This program contains all the content of our adult curriculum but is broken down to offer belt levels to provide manageable techniques as the student progresses through the curriculum. This program is designed to offer the student a fun atmosphere where they can learn and grow both mentally and physically. The student will benefit from a fast paced program designed to increase self-confidence, challenge their focus and improve coordination while teaching discipline and respect. Our Children’s MMA program was developed to provide students with a strong foundation in Brazilian Jiu-Jitsu, Wrestling, Judo and Muay Thai/Kickboxing. This program is designed to instill our core values of confidence, respect and discipline, while challenging our students to continuously strive for excellence in all aspects of life. Beginning Fall of 2018 School Season 6:45AM – 5:30PM The Future Leaders – Before and After School Program is designed to maximize youth development through the practice of martial arts. Drop your child off before school and we will ensure they have an snack and arrive to class on time and are picked up after school with our shuttle service. Students who arrive after school are given a snack and assisted with their homework followed by a 1.5 hour lesson of mixed martial arts; including our bully proof curriculum. Our Future Leaders Summer Camp’s are dedicated to fun interactive team building, training martial arts, and learning our bully proof curriculum. The children will learn how to work as a team, speak in front of a group and present the techniques they have learned on their final day with us prior to being presented with a certificate for completing the Future Leaders Program. These camps have a 7:1 student/instructor ratio to ensure the children are getting appropriate attention and quality guidance to maximize their learning experience. Looking for a more personalized training experience for yourself or for a group? Do you want a training regimen designed specifically for you? We have personal training sessions starting at $60 per hour. CONTACT US for more information about private larger group sessions. Muay Thai Beginner: Gloves, Club Shirt, Muay Thai Shorts, Hand Wraps. Muay Thai Intermediate: 16 oz Gloves, Club Shirt, Muay Thai Shorts, Hand Wraps, Shin Guards, Mouth Guard. Muay Thai Competition Team or Sparring: 16 oz Gloves, Club Shirt, Muay Thai Shorts, Hand Wraps, Shin Guards, Mouth Guard, Head Gear, Groin Cup (For Men). Boxing: 16 oz Gloves, Hand Wraps, Club Shirt, Indoor or Boxing Shoes. Boxing Sparring: 16 oz Gloves, Hand Wraps, Club Shirt, Indoor or Boxing Shoes, Mouth Guard, No-Foul Protector, Head Gear.